Sad Shibow And The Controversial Confection (I Guess?). Also, we’re A HUNDRED! Maybe it’s only controversial if you’re my mom, who’s like, wayyyy Catholic and isn’t totally sold yet on my “Go Jesus! It’s Your Birthday!” Christmas t-shirt. Otherwise, this is probably just Sunday for a lot of you, but Sunday with oddly colorful hard-boiled eggs and a disgusting amount of rabbit-shaped chocolate… and maybe a Mass or two (or what feels like three) thrown in there, if you’re into it. 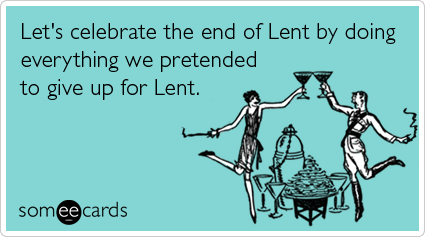 Who did Lent this year? Which one of you champs gave up meat? So how much bacon are you sucking on as you read this right now, you dirty being, you? Don’t fret, I don’t blame you. I gave up zero things and I am still currently happily munching away on a “special occasion” (read: uh… Sunday) homemade bacon-and-cheddar waffle taco. No shame = that game. So yeah, for those of us who celebrate: Happy Easter! And Happy Passover to those who celebrate it. And Happy Record Store Day, which was yesterday, for those of us who make a special point to celebrate that (this year I scored a Nas album!). 1. THIS IS SAD SHIBOW’S 100TH POST!!!!!!!! WHAAAAAAAT?! How the hell did that even happen? I cannot believe my electricity bill isn’t higher, given how much I have abused my oven in the name of this blog. Cheers to us, guys! 2. 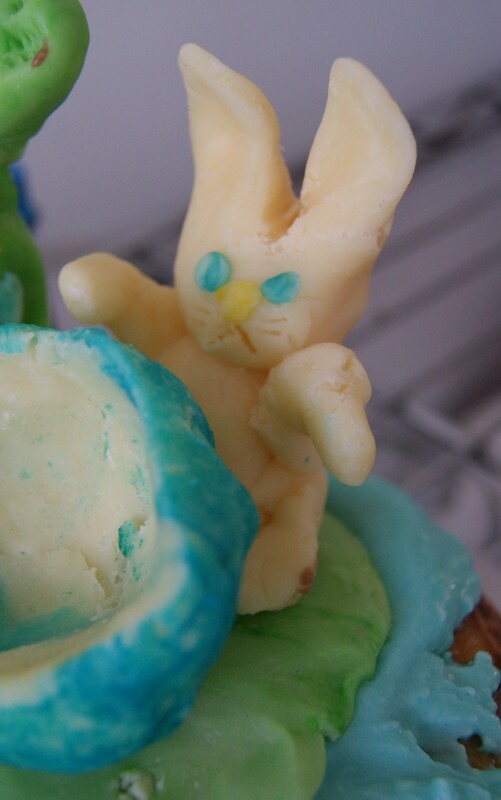 It’s Easter, which is a pretty decent dessert holiday around these parts. Given that this is a special post, though, (did I mention that I’ve written here A HUNDRED TIMES?) I thought I’d do something pretty wacky this time around. 3. I’m a little pissy. I feel like some people tend to use special occasions to just be total, hypocritical rats. Like, oh, let’s celebrate (choose any one here) the: birth of Jesus/fight of our forefathers/death and then rise from the dead and then rise into the sky of Jesus/Record Store Day by just being total losers. Let’s hurt people! Punish them for nonsense reasons! Let’s just be everything that’s the total opposite of good, and let’s use our belief systems to justify being that way! I couldn’t hold any of that in any longer. Whew. Ho-kay. So, I’ve been trying to experiment more outside of my baking comfort zone, and finally came around to the idea of using modeling chocolate in my desserts. Most of the reason I’d never wanted to use it before is I am a HORRIFIC artist, which you’ll see below in pictures. My Play-Doh projects basically all looked like variations on the same amoeba. I never truly developed as an artist, and I’ve accepted that I probably never truly will. 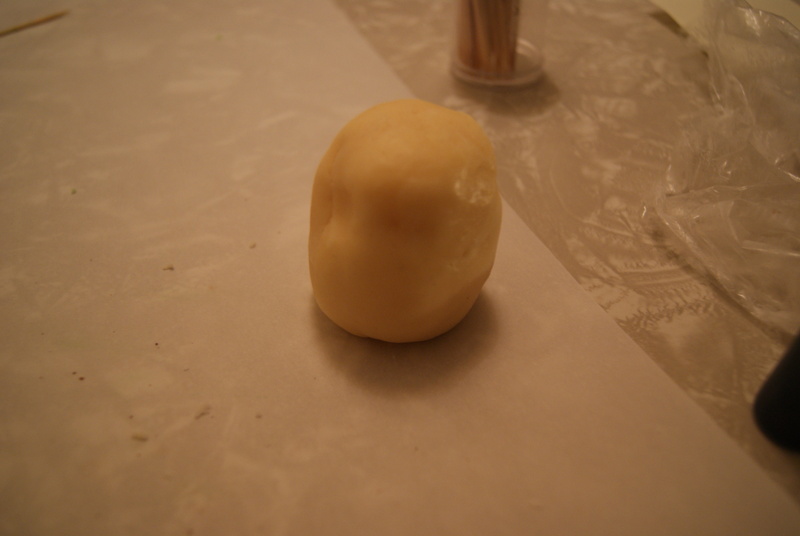 Still, I thought it would be fun to try, especially given how easy modeling chocolate is to make. Also, unlike fondant, which is very delicate and difficult to manipulate, modeling chocolate is incredibly flexible and easy to work with, as it doesn’t dry out and can be worked and reworked to your heart’s desire. It also tastes like chocolate, because it is chocolate! Huzzah! Lastly, I decided to use a butter cake because originally I was planning to shape this cake into something that resembled something vaguely holiday-related, and butter cake is one of the sturdier types of cake there is. Once I was done with the modeling chocolate portion, though, I decided to just sort of cut my losses and move on to bigger and better things in life. Let’s just get to work on this thing. Note: this is the most helpful video you will find on the subject. Let’s start with our modeling chocolate. Basically, pour the corn syrup into your bowl of melted white chocolate, then fold the syrup into the chocolate with a rubber spatula, mixing it fully. You’ll want every bit of chocolate to have been touched by the syrup. Keep folding until the mixture forms a ball and pulls away from the bowl– it should be really tough to mix at this point. Immediately wrap modeling chocolate tightly in saran wrap, then let sit overnight at room temperature. When ready to use, unwrap the chocolate, pull apart pieces, and then knead to workable consistency. This is a face. 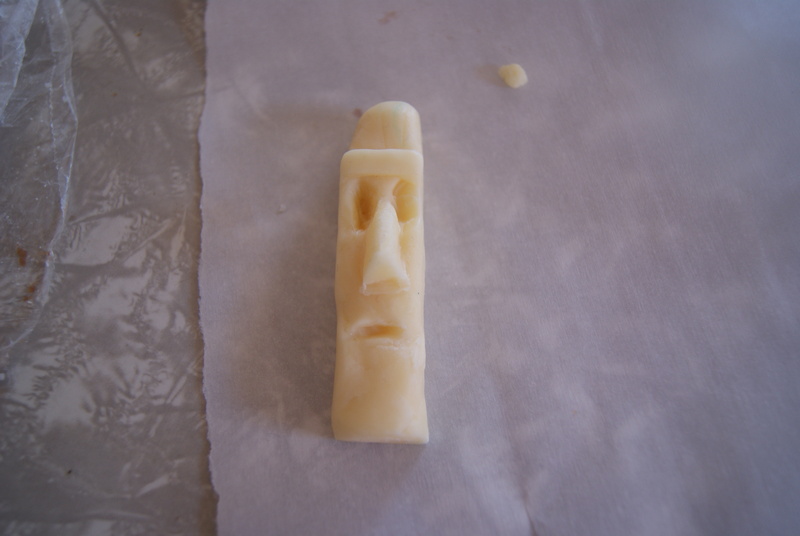 It will eventually become the face of Jesus. I’m just trying to show you what “workable consistency” means. Sorry for creeping you out. To dye your modeling chocolate, make sure to use gel food coloring. 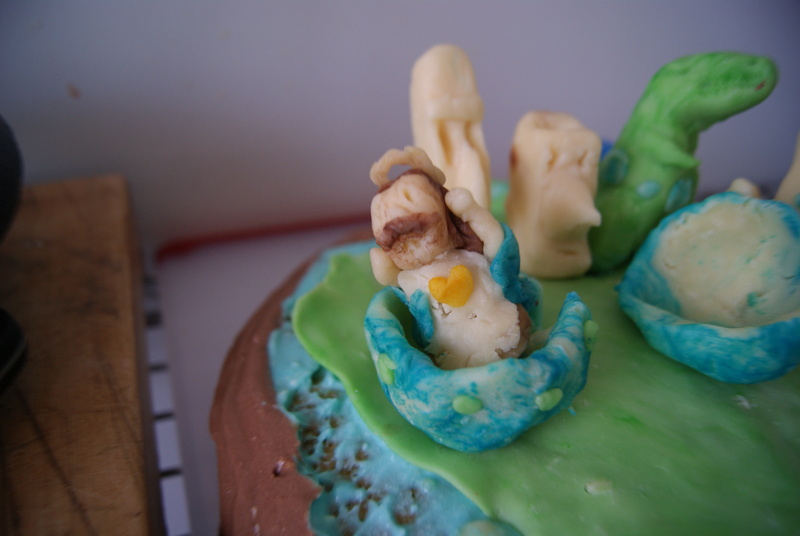 Squeeze a couple of droplets onto your desired piece, then knead the chocolate to spread the color around. I’ve also found that rolling the chocolate in cocoa powder works very well to turn it brown, in case you happen to be making a brown-haired religious icon for your dessert, too. If you’re worried about the mixture becoming too slick and sticky in your hands, set it down for a few minutes to return it to room temperature. I know what you’re going to say: Shibow, you’re being modest. You’re an amazing artist. Well, my boyfriend made this guy. So now you know why I took so few pictures of this process. If you’d like, you can create your various shapes, then place them on a plate and refrigerate to harden while you work on your cake. The cake’s actually pretty easy– just dump all of the ingredients in a large bowl and beat together with an electric mixer on high, stopping often to scrape the bowl with a spatula. Preheat your oven to 350ºF, and spread the batter between two 9-inch pans or three 8-inch pans that have been buttered and lightly floured. If using 9-inch pans, bake the cakes or 25 to 30 minutes. If using 8-inch pans, bake for 30 to 35 minutes. I’m a dingaling, so I baked this in a springform pan and had to bake it for WAY longer. Don’t be me. Cool the rounds for 10 minutes in the pan, then remove and cool on racks completely for an hour. While the cakes cool, work on your frosting. Beat the butter and sugar together on low speed until blended. 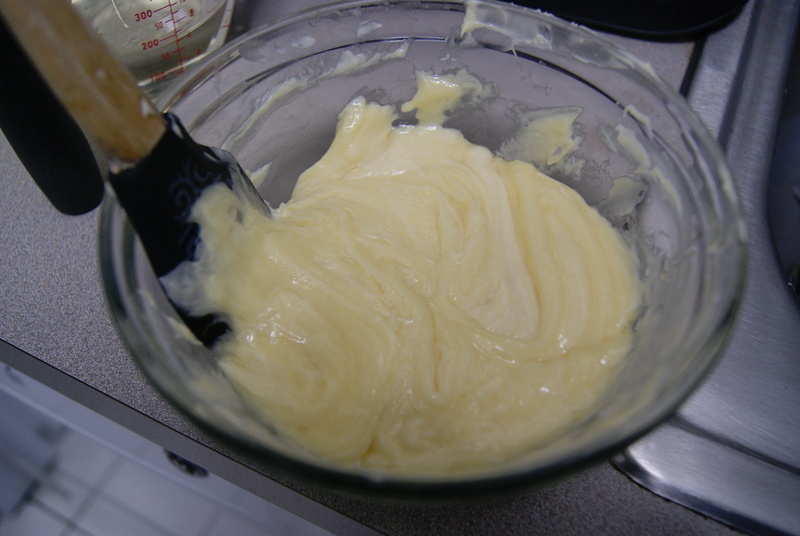 Slowly add in milk, one tablespoon at a time, until frosting reaches desired consistency. Refrigerate until ready to use. Note: If you plan on cutting these cakes into crazy shapes, wrap them tightly and completely in plastic wrap and freeze them. This will make it easier to eventually cut into them without worrying about them crumbling before your eyes. As I mentioned, my dingaling-ness prevented me from being that bold. I kept my cake as round as I could. Maybe next time, kids. Ok, so, I guess the best way to explain this cake is by showing it to you, and then breaking down the various components. Don’t laugh. 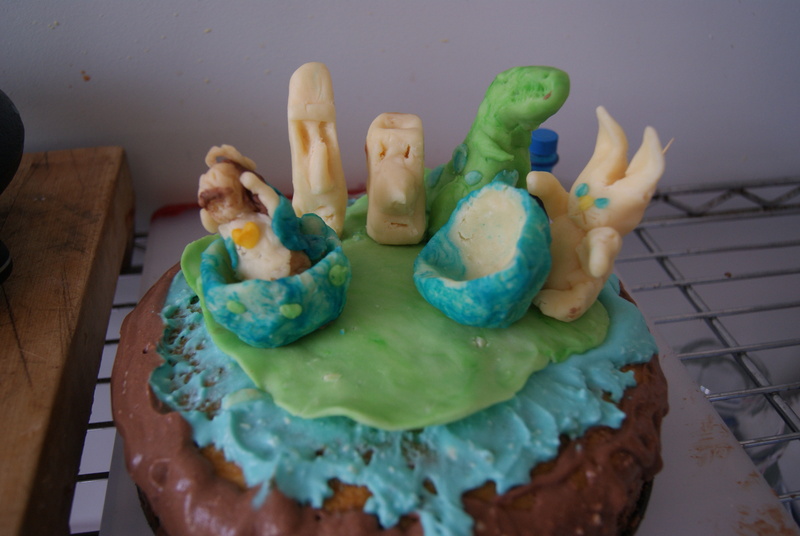 I never claimed to be a master baker (damn it! I said DON’T LAUGH! Ok, I guess I walked into that one), so this is going to seem pretty ridiculously bad to a lot of you. Um… yeah. So… here it is. We dyed parts of Jesus, the egg he…uh…hatched from, the bunny’s eyes and nose, and the whole damn T-Rex. 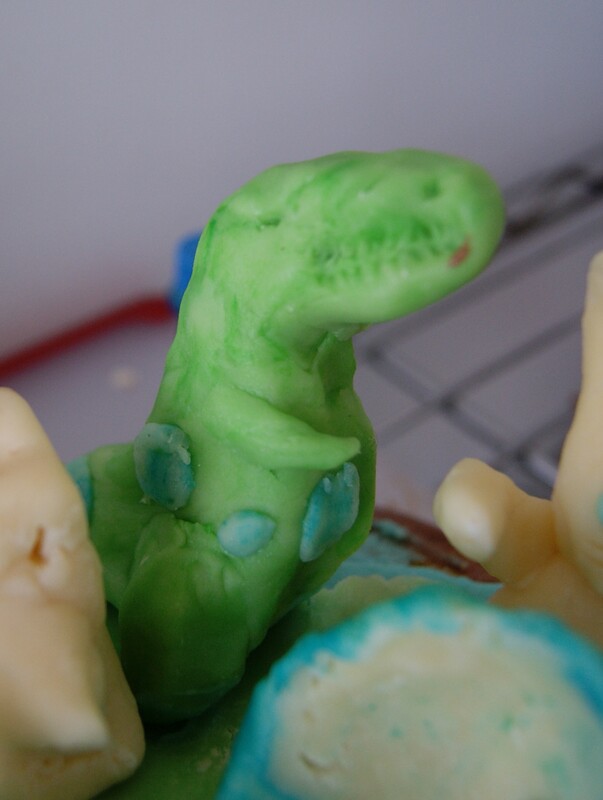 Oh, also, everyone who’s about to compliment me on the awesome T-Rex: boyfriend made that one too. One of us studied at the School of Visual Arts, and the other of us is me. Maybe it’s better to see these in close-up. Whew. Here goes. This is Jesus. Someone mistook him for “Holy Super Mario,” which I’ll accept. 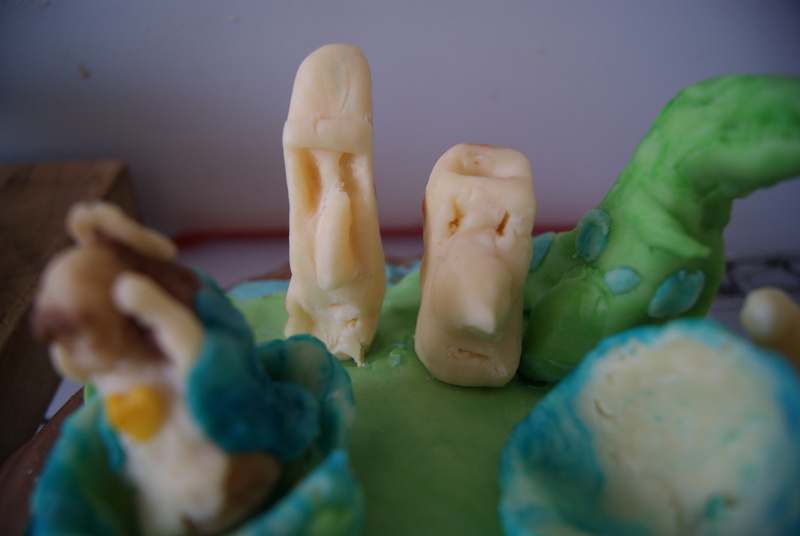 Easter Island Dudes. One is legit, the other is a poser. This is the T-Rex. He is my absolute favorite.